When Barrow Neurological Institute opened its doors in 1962 with only 50 patient beds, it was revolutionary – being one of just three neurological institutes in the United States at that time. Today, Barrow has 187 hospital and rehab beds and more than 5,500 neurosurgeries are performed annually – the highest volume in the country. But Barrow clinics, research labs, rehabilitation gyms, operating rooms, and offices are currently scattered across an eight block radius. With an aging population and an increase in cases treated each year, surgeons are in need of additional space to provide lifesaving care for patients diagnosed with aneurysms, arteriovenous malformations, brain, spine and pituitary tumor, spine curvatures, and more. And while the world’s top researchers naturally migrate to Barrow due to the institute’s innovative track record, lab space is at a premium, risking innovative outcomes that could affect patients’ lives. To solve these challenges, the Virginia G. Piper Charitable Trust made a $2 million pledge in support of the Spetzler Legacy Project. 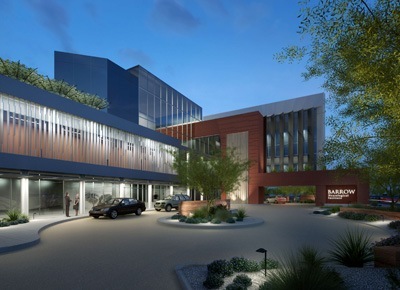 The project, which began as a vision of former Barrow president and CEO Robert Spetzler, MD, will culminate in the construction of the new Barrow Neuroplex, a five-story building that will serve as the heart of Barrow, centralizing and integrating clinical research, neurology, and neurosurgery for enhanced patient care. That vision is carried on today by President and CEO, Michael Lawton, MD. “This state-of-the-art facility is critical to helping Barrow become the world’s leading neuroscience center, because it will change the environment in which our team works create a portal for destination patients and expand our space for research,” says Dr. Lawton. Thanks to the support of the Virginia G. Piper Charitable Trust and other generous donors, Barrow expects to break ground on the Neuroplex in 2019.